A more detailed look at projects. Here is a quick relay driver circuit showing how to drive a relay from a microcontroller – specifically, one of my GRBLDuino products. The circuit as shown is for a spindle control application but the circuit remains the same for any other use. 5V and GND are self explanatory. SPINEN is the signal coming out of the microcontroller and typically 0v DC or 5v DC. Microcontoller outputs can only switch a few mA before damage occurs, but this circuit allows the transistor Q1 to take the load and switch as much as it is rated. To create a spindle control relay on GRBLDuino products, SPINEN connects to the Sp EN terminal block (the side labeled +). GND is connected to the other side of this same terminal block. 5V must be connected to a 5v source – the simplest way is to use a wire with a Dupont plug to connect to the high side of the Lim. H/L header. Here are more GRBLDuino posts! The GRBLDuino Uno Shield is easy to assemble with basic soldering skills. All parts are standard through hole components to make assembly easier and quicker. Assembly should take between 30 minutes to an hour for someone of moderate experience. These are for sale through a few outlets. The best price will be at the Eccentric Workshop store, but they are on Tindie and eBay. Lately there has been much discussion about and visibility of electronics, electronics repair, and soldering/microsoldering. I want to shed some light onto the tools and techniques to answer many of the common questions out there. This won’t be an all-encompassing guide, but will evolve and grow over time. You’re going to need some tools and many of these tools can be quite expensive. To reduce the costs a bit, don’t run out a buy all of the new tools as you may not like some and may not need others; it is much better to work for a while a see what you need and how you work (I found although I bought an iSlack opening tools, I really don’t like it or use it). I advocate buying used tools when possible and practical (I opted to buy used soldering and hot air stations and upgrade later rather than buying cheap clones or new name-brand). Obviously, don’t buy used consumable tools (tweezers, driver bits, etc) or equipment without making sure it is a good enough deal to be worth the risk. I also advocate buying good quality tools – buy the best you can afford and buy it once. I bought a used Hakko 936 soldering station after looking at all of new offerings and the clones. I preferred the temperature adjustment knob over the digital interfaces and I didn’t want to get a clone of questionable quality for nearly the same price. Fortunately, most of the parts are available still and replacement tips are plentiful. I also purchased a used Hakko 850 hot air station after considering Quick, Aoyue, Atten, and many other stations including new Weller, Hakko, Metcal, and JBC. I was into a complete Hakko setup for under $200. If you can’t find a used name brand, the Hakko FX-951 and Quick 861DW are good new options. I only upgraded because I found a deal on a Hakko FM-203 and FM-2022 (plus more) for less than the price of the FM-2022. It didn’t hurt that selling the Hakko 850 paid for most of the upgrade. Along with your soldering and hot air stations, you will also need solder, flux, soldering braid, and maybe solder paste. Skip the paste if you won’t be reballing ball grid array (BGA) devices or doing new surface mount device (SMD/SMT) work. I suggest either a 60/40 or 63/37 leaded solder. Lead free doesn’t flow as well, wet as nice, or melt as easily. Stick to a name brand like Kester and you will be just fine. I have various sizes ranging from .015” through ⅛”. For this type of work, a size between .015” and .062” should work fine. To remove excess solder and clean pads, solder wick is needed. It is much easier than trying to use a solder sucker and cleans better. You will need this for just about any type of rework you do. Solder wick comes in various sizes but 3.5mm is a good generic width. It works much better if flux is applied as it lets the solder flow up the wick better. Flux seems to be a personal preference item as there are numerous brands and formulas available. I, and many others, like the Amtech 559. Make sure you buy it from a reputable source as it is often fake on Amazon and Ebay. Extra flux will make your rework and clean up much easier and better as it provides cleaning action and allows the solder to flow. Additional flux usually isn’t needed if you are soldering properly with flux core solder wire. Screw drivers and bits is one area where you should spend more for quality and where you shouldn’t buy used unless you can thoroughly check out the tips. The iFixIt kits listed below are good quality and have a lifetime warranty on the bits – if they get damaged, iFixIt will replace them. Other high-quality options include Wiha, Wera, and Moody. You can get by with lower quality bits and drivers but you will feel the difference as they slip more and don’t fit fasteners quite right. There are a lot of little things in this work. We’ve covered some above: solder, solder paste, solder wick, and flux. Others are tweezers, tip cleaners, adhesives (such as the double sided Tesa 61395), Kapton tape, gloves, wipes, and cotton swabs. Although tweezers are expensive, they really are a consumable item. Once the tips get mangled, they just don’t work right and will need to be replaced. There are some cheaper options, but you generally get what you pay for. I have this cheap set, and they work but they are much lower quality. Some of the specialty tools may be required for certain tasks you need to do or may simply make the tasks easier. The iOpener kit from iFixIt is a step up from using hot air to loosen display adhesive. Another step up is the heat pad which holds the device at a constant temperature while work is being done. Sure, you can replace a screen using a hair dryer or heat gun, but it isn’t the right tool for the job and is risky, and takes more time. 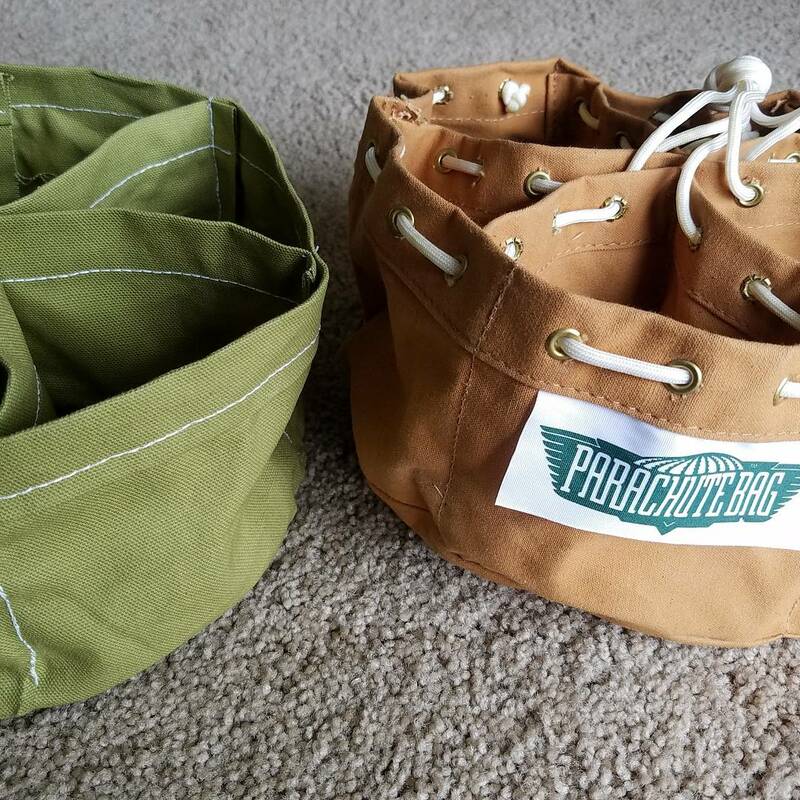 The parachute bag is based on a product of the same name from the Portable Product company. It is a six compartment bag with drawstring closure. I got turned onto them years ago by Jimmy Diresta and have found a few on eBay but they are getting more expensive and harder to find. 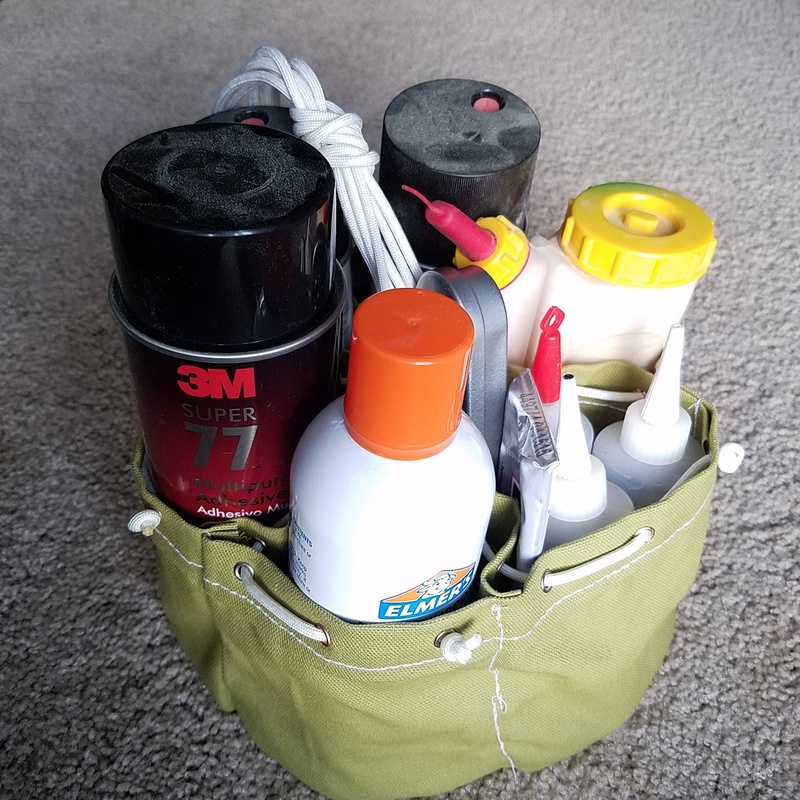 The bags are great for storing hardware such as nails and screws or anything else fitting in the pockets. I use one of mine to store an assortment of adhesives, another has various screws, and another holds nails. The realbag is made of cotton duck canvas heavier than the 9 oz I found. I’d suggest using a #10 or #12 cotton duck canvas. For durability, it may be a good change to incorporate a leather bottom like some canvas bags have. 1. Cut all pieces to size. 2. Mark rectangular panels along long dimension on one edge at 1/4″ and 1 1/4″ from the edge for the top hem. Mark 1/2″ on all other sides of rectangular panels and 1/2″ in on circular panel as sewing guides. Mark 5 1/4″ inch increments along inside (opposite hem) of 32 1/2″ length, being sure to start at 1/2″ mark from previous step. These are the sew lines for the interior dividers. Fold the bottom circle in half an then into thirds to make 6 creases where the interior dividers will be sewn. 3. Fold, iron, and sew top hems on all panels. The finished hem should be 1″ wide with 1/4″ folded under. 4. Once all top hems are sewn, align all three small panels and mark middle of 11″ dimension of divider panels as a sewing guide. Sew along this line to join all three small panels together to form the interior dividers. 5. Sew the outside panel ends together with the hem facing out. Sewing 1/2″ in from each end will ensure the ring formed will join to the circular bottom. 6. Working inside out, align sewing alignment marks on the bottom edge of the outside panel and the bottom circular panel. 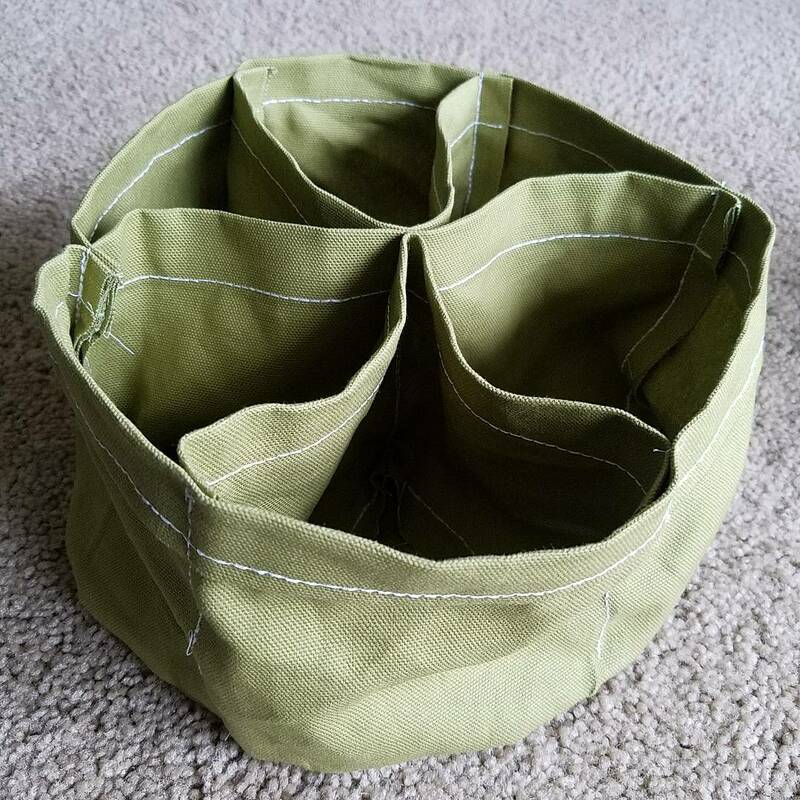 Sew around the full circumference to form a pouch or bucket. 7. Align ends of dividers with the marks on the outside panel. Sew along the alignment lines down sides and across the bottom to the center. Repeat for each divider segment. 8. Each section gets 4 evenly spaced grommets in the top hem to allow for threading the drawstring closure. 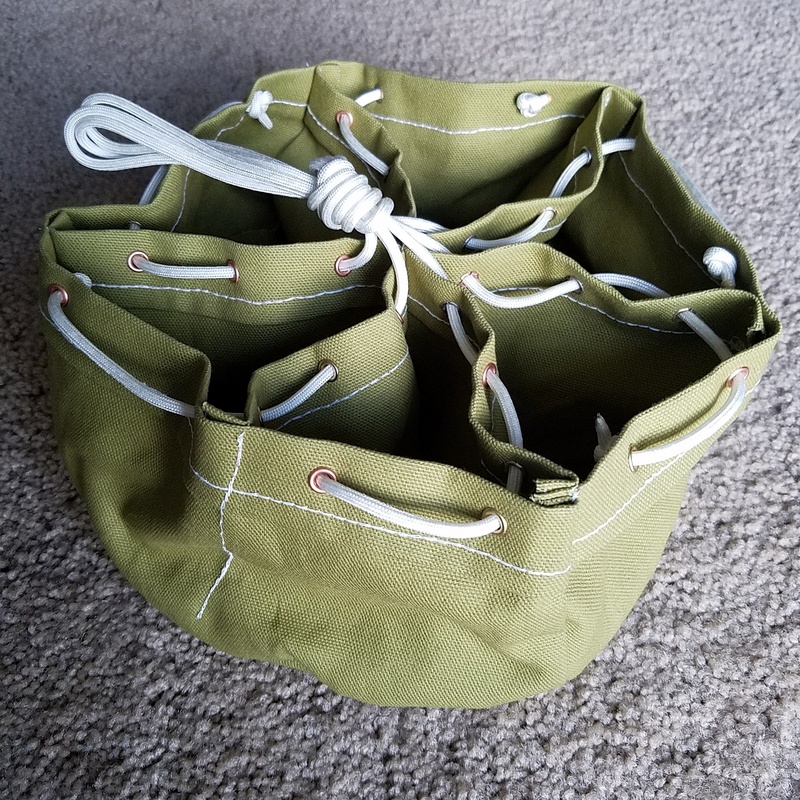 9. thread about 1/4 of the parachute cord drawstring from the center out each side through the grommets. There will be loop in the center to form a handle and a knot secures the end after the last grommet. I like to tie an overhand know around all of the lines to keep them together.